How many times have you heard a song and thought, ooh, that’s a bit near the mark, or how did they get away with that? Oliver’s Army is a good example using a word that was acceptable in 1979 but not these days. This week’s choice dates from 1968 and even back then some people frowned upon it. Given today’s society it’s still a bit surprising that it get any airplay at all, but it’s a staple favourite of many radio stations. 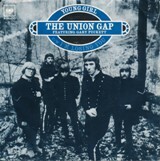 The song in question is Young Girl first recorded by The Union Gap featuring Gary Puckett to give it its correct credit. The song was written by Columbia Records’ staff producer Jerry Fuller who discovered The Union Gap when he saw them performing at a San Diego bowling lounge. Jerry, who was also a singer/songwriter, was born into a musical family as both his parents were singers and his father once performed with the Light Crust Doughboys, before they became Bob Wills & the Texas Playboys. In 1960 Jerry wrote Travelin’ Man for Sam Cooke, but Ricky Nelson’s bass player, Joe Osborne, was in Sam Cooke’s office and heard the track. Sneaking it out of the office, he played it to Ricky, who quickly recorded it without Jerry even knowing. Gary was born in Minnesota in 1942. His first band was The Outcasts, followed by Gary & The Remarkables, but then taking the name from a Washington State suburb, he formed The Union Gap in 1966 and came up with the gimmick of wearing American Civil War uniforms giving all the members a military moniker, so on parade were vocalist/guitarist ‘General’ Gary Puckett, ‘Private’ Gary Withem on keyboards, ‘Corporal’ Kerry Chater on bass, ‘Sergeant’ Dwight Bement on the sax and ‘Private’ Paul Whitebread on drums. It was interesting in the 50s and 60s that the label credit went to the group featuring the lead singer, very odd. The first to do it were the Four Aces featuring lead singer Al Albert and The Teenagers featuring Frankie Lymon followed soon after. I could never fathom out why this was especially in the case of the Union Gap where Gary felt he was in charge, “They understood that I was the band leader,” Gary explained in an interview, “They understood the outfits were my idea and I had put it together. We didn’t always agree on points, in fact, there was one member of the group that almost left because he didn’t think I could see beyond the nose on my face. That was his prerogative. He ended up staying with the group for several years and gained some success through it. There came a point when I think they started taking exception to it because the pay scale changed. I was kind of splitting it all down the middle and then my management said, you’re really the force behind this you should make a little more money, kind of thing. So, when that started to happen then I think there started to be dissension in the ranks.” The follow-up hit, also written and produced by Jerry Fuller, Lady Willpower, gave the credit as Gary Puckett And the Union Gap, but bizarrely, their third and final hit, Woman Woman – note the theme, had the same credit as Young Girl. Young Girl certainly carries a message about older men falling for younger girls. With the opening lyric, ‘Young girl, get out of my mind, my love for you is way out of line, better run, girl, you’re much too young, girl’ there is a lesson to be learnt. If the song had been around 10 years earlier, would Jerry Lee Lewis have thought twice when he married his 13 year-old cousin Myra? It obviously didn’t bother Elvis Presley when he started dating 14 year-old Priscilla. As for Bill Wyman, Mandy Smith was only 13 years old when they first met, none of those marriages lasted. Young Girl spent 17 weeks on the UK singles chart and due to its continued airplay, was re-issued in 1974 where it reached number six and spent a further 13 weeks on the chart. Many have covered the song including Gary Lewis and the Playboys and the Lettermen. In the UK chart, the entertainers Joe Longthorne and Darren Day both had a go and peaked at 61 and 42 respectively and even the cast of Glee got their teeth into it by incorporating it into a medley with the Police’s Don’t Stand So Close To Me. On one of their recent ‘Solid Sixties’ tours I was advised that the Searchers still include it in their set which, for a bunch of 70 year olds, seems a little worrying. Even Marty Wilde, who still tours, said he was worried about singing ‘Why must I be a teenager in love’ at the age of nearly 80.